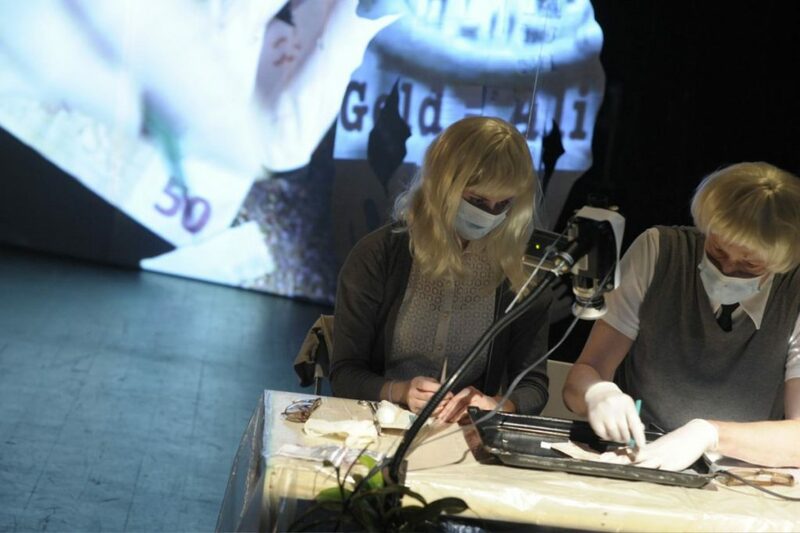 Awarded the Goethe-Institut Prize at the 8th Festival Politik im Freien Theater 2011 in Dresden. Most people consider money a means of exchange. This naive misconception has lead to the current crisis. Money is not a neutral tool, it is a gigantic, living organism, on its way to the next stage of evolution. Its only goals: to increase, spread, accumulate. No sphere is safe. Panic breaks out, mass hysteria. Can politics stop it? Can the economy keep it in check? What is money’s true nature? Using old Science-Fiction thrillers, Money – It Came From Outer Space delivers the cruel proof: money is an alien. Its origin is unknown, its movements uncontrollable, its will to expand unconquerable. And man is nothing but a host anymore.